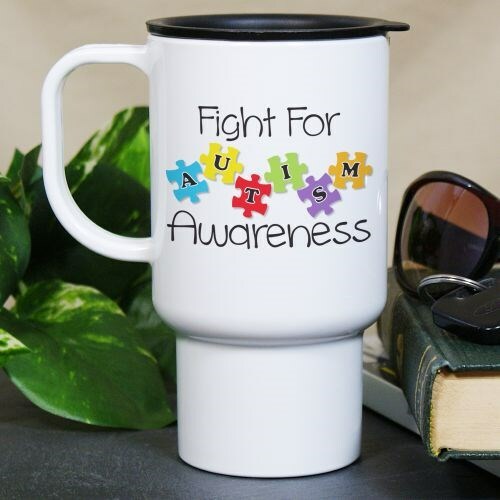 Now, you can fight for autism awareness on the go when you carry this unique autism awareness travel mug. Wherever you go throughout the day, people will be aware that this cause is important to you, and it will make them more aware of the impact autism has on your life. Shop Autism Awareness Products today! These travel mugs are dishwasher safe and available in different sizes ranging from 11 ounces to 20 ounces. Additional Info This autism awareness gift would make a great gift item to give friends and family members who are helping you at your next autism awareness fundraiser. On MyWalkGear.com, a portion of all proceeds go to the charity or organization of your choice. Help us fight autism today!